Political and religious circumstances stemming from the Enlightenment and the French Revolution had created in 19th century Germany, a desperate educational situation with far-reaching effects on church and society. 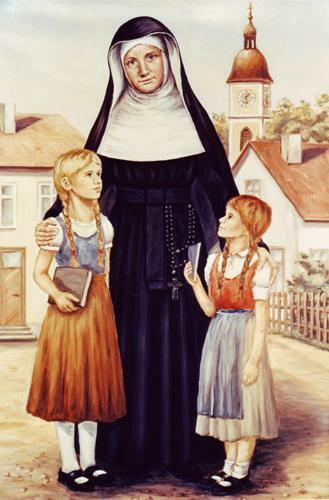 The rationalists’ insistence on the primary reason weakened appreciation for Christian education; the confiscation of church possessions by the state led to the suppression of many convent schools and made it virtually impossible for young girls to receive even a basic education. The structure of her congregation flowed from her perception of the needs of those she served as well as those of her sisters. By sending sisters in two’s and three’s to reach people in rural areas, she departed from the contemporary pattern of large, formal monasteries. In order to maintain a common spirit, direction, and goal among the sisters, among the branch houses, and later among the providences, she insisted on unifying central government in her congregation. In contrast to established precedents and the prevailing spirit of the times, she was convinced that a woman could better understand, and, therefore, direct and motivate her sisters. When her views about the government of her congregation were misunderstood, her trust in God and her deep loyalty to the church sustained her in the suffering she endured. The young congregation, too, knew death and resurrection as integral to its life. Extreme poverty characterized its early decades; in those years the sisters also experiences contempt and abuse from those who could not accept their values. In the 1860’s sisters suffered from wars in Europe and America. Political pressures led to the expulsion of the sisters of Wesphalia and Silesia from their native land in the 1870’s. At the same time, new life and growth came to the congregation. Appreciated and supported by hierarchy and laity, it spread from Bavaria to eleven countries of Europe and North America. At the time of Mother Theresa’s death in 1879, more than 2,500 School Sisters of Notre Dame were living religious life according to her spirit. They met the needs of their time by educating girls, principally in elementary schools but also in orphanages, day nurseries, and industrial schools. They trained future teachers and pioneered in the development of kindergartens. For girls who were factory workers, they established homes and provided night schools where these girls could receive basic education. Frederick Fries, Life of the Reverend Mother Mary Theresa of Jesus Gerhardinger, Foundress and Superior General of the Congregation of Poor School Sisters of Notre Dame (Baltimore, Md. ), p. 329.